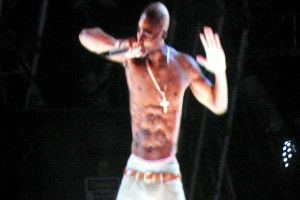 CNN reports [via Vulture] that Digital Domain Media, the company that birthed Tupac Hologram, has gone bankrupt. A sad day for the inexorable march of progress, to be sure. The company, which was co-founded by James Cameron almost 20 years ago, had worked “on special effects for scores of big movies including Pirates of the Caribbean, Transformers and Cameron’s Titanic. The company won an Oscar for its work on reverse-aging Brad Pitt’s character in The Curious Case of Benjamin Button. But Digital Domain’s financials have long been a concern. Since the company was typically hired by Hollywood studios on a contract basis, its revenue stream was pretty small.” Meaning: Digital Domain was betting the house on Tupac Hologram. Sure, it felt a bit unseemly. But any child could tell you it was the inevitable end point for a nostalgia-obsessed culture. Earlier this summer, post Holo-Pac, we huddled and whispered sadly to one another, “Flesh and blood would soon be out; the hologram army rises!” For now though, amazingly, the future has stalled out. It can’t last long. Eventually, a new company will pop up promising new and improved holo technology. So let’s enjoy this while we can: Good-bye, Digital Domain Media; good-bye for now, creepy holograms.